Part Number WB13K21 replaces: 2494, AP2020569, WB13K0012, WB13K0013, WB13K0014, WB13K0021, WB13K10009, WB13K10026, WB13K12, WB13K13, WB13K14, WB13K21. If the oven is not coming on but broiler does is this the igniter? You can hear it trying to make contact! Hi Joan, Thank you for your question. It sounds like it may just be your igniter that is the issue. You should be able to test that part with a multi meter to see if it is working correctly or not. It should read somewhere between 50 - 1100 ohms of resistance. Good luck with your repair. My oven won't turn on when i turn the oven nob, nothing. Hello Travis, Thank you for your inquiry. We would recommend checking the following parts to fix your issue: flat style oven igniter kit, safety valve, burner tube, spark module, oven thermostat and pressure regulator. You can test the parts with a multimeter. If you are unfamiliar with how a multimeter functions, there are YouTube videos available to assist you. Hope this helps! My oven works fine but the broiler igniter will not glow. Does the broiler and oven have the same igniter? What part number would work for the broiler igniter? Hello Terry, Thanks for your question. The flat style oven igniter is used for heating your oven, but there are two other igniters commonly associated with the broiling element. Thankfully, all of these can be tested relatively easily. If they glow for 90 seconds without generating heat, they are faulty and should be replaced. I hope this helps. Hi Hank, Thank you for the question. 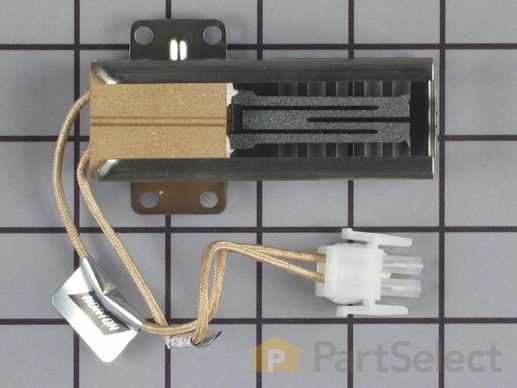 I recommend replacing the Temperature Sensor, PartSelect Number PS2374070.The sensor maintains the temperature inside the oven to the set degrees, when defective the oven might not obtain the correct temperature you set or will over heat. Hope this helps! Kenmore gas oven. The oven will come on but will not reach high temperatures. The ranges on top will all light up. Hello Reginald, Thank you for your inquiry. We would recommend checking the following parts to fix your issue: burner with igniter, pressure regulator, dual oven safety control valve, probe/sensor, and oven control board. You can test the parts with a multimeter. If you are unfamiliar with how a multimeter functions, there are YouTube videos available to assist you. Hope this helps! The oven does not heat at all. There is no clicking sound. Hi El, Thank you for your question. There could be a few parts that are causing that issue. I would suggest testing your igniter first. You could also test your temperature sensor as well. You can test both of those parts with a multi meter to make sure that they are working correctly. If both of those parts are fine you may want to also check your spark module. If that part is also working, it may be your control board that is the issue. I hope that helps. Good luck with your repair. When we light the oven it makes a loud boom. Hello George, thank you for your question. We would recommend replacing the igniter. Usually when this happens it means the igniter is taking too long to light. I hope this helps. Hi Scott, Thank you for your question. This part should read anywhere between 0 and 1100 ohms of resistance. If the meter does not move then your igniter will have to be replaced. Good luck with your repair. Hi Anthony, Thank you for your question. You should purchase the igniter that is listed under your model number to insure that your stove works correctly. I hope this helps. Thank you and have a great day! Hi Anthony, thank you for your question. The igniter might be the issue where it is not igniting right away and so you smell gas before it actually ignites. The only other part that I could think of being the issue might be the safety valve or regulator. I hope that helps. Good luck with your repair. my oven repair was a sucess!thanks Parts select,they oven igniter kit fit like a glove. the video s were helpful also. This was one of the easier repairs ever. Videos made the entire process crystal clear. Afterwards, we adjusted the knob for the oven thermostat to bring the oven to the correct operating temperature. The oven works great. Very easy to install. Movie was very helpful. Works just fine. Fast shipment great Price . Part was fine, video available. No problem, cooking again. Easy repair, the video made it very easy. The part worked perfectly and install was easy and quick with help of the video. I also appreciated how quickly the part came! Thank you ! I will highly recommend your company. Loved using this website. The features available on the site helped me to diagnose the problem and pick the appropriate part. My stove is a Hotpoint so the video installation wasn't an exact science but we figured it out quickly.